Chicken grillers make a wonderful summer snack, and there's no need for an outside grill to cook them. 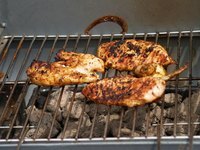 A broiled chicken griller can still maintain flavor as long as the spice and marinade are strong enough. The trick is to keep the chicken moist with a baste so the broiler does not remove all the juice. Chicken with skin will maintain better in the oven, but coating the chicken in a strong baste works best. Treat each piece of chicken with its own cooking time, since pieces will cook at different speeds depending on size and location in your broiler. Mince mint and garlic, as finely chopped as you can . Place in a mixing bowl and add 1/4 cup olive oil, lemon juice, salt and pepper. Whisk ingredients together and pour into a ziplock bag with chicken breasts. Refrigerate for one hour. Adjust oven rack so it is about 5 to 6 inches from the top. Preheat oven on "broil" for nine minutes to warm up. Chop the head of the jalapeno pepper off and slice it in half. Remove the seeds. Chop the remaining pepper and onion. Heat the remaining 2 tbsp. of olive oil in the saucepan on medium-high heat. Add butter and wait for it to melt. Add the pepper and onion. Cook for four minutes. Remove from the burner and stir in the mustard and honey. Place the chicken breasts on a broiling pan and put it in the oven. Baste the breasts with the mustard mixture on each side as it cooks, every two minutes. Cook for eight minutes total, turning once. Remove from heat and serve.